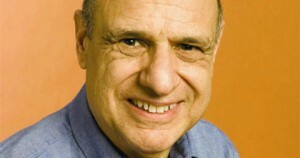 Following on from our conversation about Red Letter Christians, I wanted to delve deeper into Tony Campolo’s life and theology. A quick Google search had turned up more than a few websites accusing the professor of heresy. It’s a confrontational and offensive word that is often thrown at well-known Christian leaders from websites with the word ‘discernment’ in the title. But Campolo’s story stands out. Why? Well, you don’t meet many people who have been put on a literal theological trial. The year was 1985 and Tony had been dropped from some high profile speaking engagements because his book A Reasonable Faith stated “Christ lives in all human beings, regardless of whether they are Christians." Looking back on that time, Tony remembers entire magazines being devoted to debating the issue. “Those that took the position that Christ does come to us sacramentally through the poor and the oppressed have won the day. Groups like World Vision, Compassion International and Prison Fellowship all go to the 25th chapter of Matthew and say ‘what you do to the least of these you do to Christ himself’. But while the furor of 1985 is long gone, Tony has been immersed in plenty of controversies since. 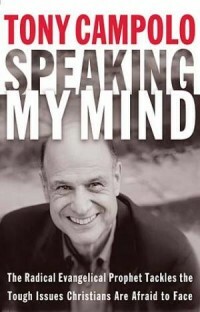 He's even written a book that deliberately tackles contentious issues called Speaking My Mind. While he doesn't shy away from tough issues, he admits being labeled a heretic bothers him. There is perhaps no more divisive issue in the evangelical world today than that of homosexuality. Even Tony and his wife Peggy have publically disagreed with each other on the issue. It’s an answer that will please neither extreme. It won’t satisfy those who believe that homosexuality has a simple cause and can be cured like a disease. But neither will it satisfy those who believe homosexual practice is not sinful. Once again, Campolo escapes the theological boxes that others so badly want to put him in. Continuing our discussion on theology and politics, I ask about Tony’s friendship with Bill Clinton. “Bill Clinton for way more than a decade has been a friend. I have met with him regularly, before the Lewinski scandal. There was a need for counseling and the press immediately became aware I would be counseling the President to keep him from the mess he was falling into. He’s been pretty good ever since then!" I was looking forward to hearing more about Campolo’s friendship with the President when the fiery theologian gets sidetracked into talking about American party politics. Speaking of the right leaning Republicans he says: “Their attitude toward Obama is full of hate and there are racial prejudices involved in all of that. There’s a statistic done by Princeton Theological Seminary in New Jersey. 38% of the people interviewed in the study believed that Obama is the anti-Christ. That kind of thinking is just off the chart!" And with that, my time with Mr Campolo is over. It's been a fascinating discussion with one of America's most prominent Christian thinkers. While it's easy to see where those who are disgruntled by his statements are coming from, it's also easy to see that the speaker has been severely misunderstood more than once. Like so many well known Christian leaders, Campolo's reputation proceeds him. Whether that reputation is a positive or negative one very much depends on who you talk to. To read part one of our interview, click here. When he says "There is a common belief among evangelicals especially in your country that somehow this is a chosen behavior pattern or a case of psychological non adjustment." is he referring to UK evangelicals? I wouldn't have thought that UK evangelicals are more harsh than US ones are (given the press they get, which might well be exaggerate and false), plus I also don't think people have as developed a perspective as that. Many evangelicals would talk as though people are born gay but should remain celibate. I'm not saying that detracts from what he says, or indeed alters it a great deal, but I was just curious what he refers to. Hi Christopher, yes I believe when he says "your country" he is referring to the UK.